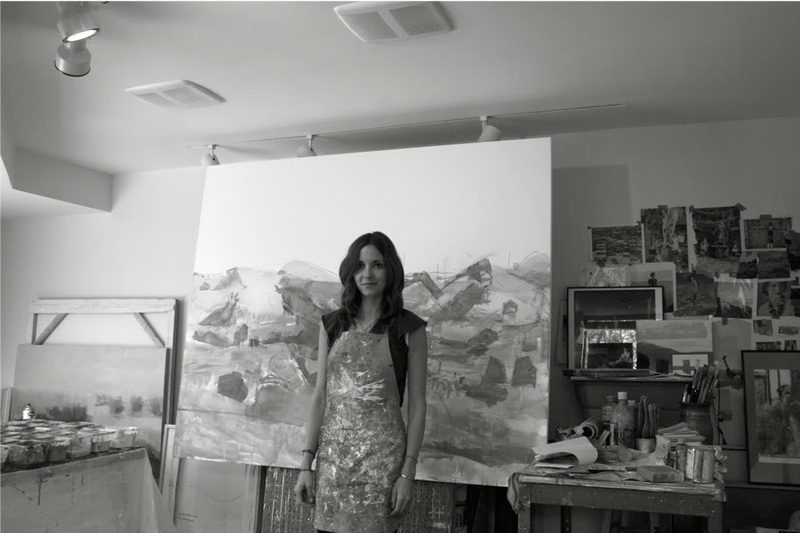 Her large-scale paintings of mundane objects bring you in with every layer of paint. Ms. James captures a bookcase as if it is breathing. The colors vibrate off one another then slowly pool into a faded color field, only to remember you are looking at a common bookcase. There is nothing common about it. 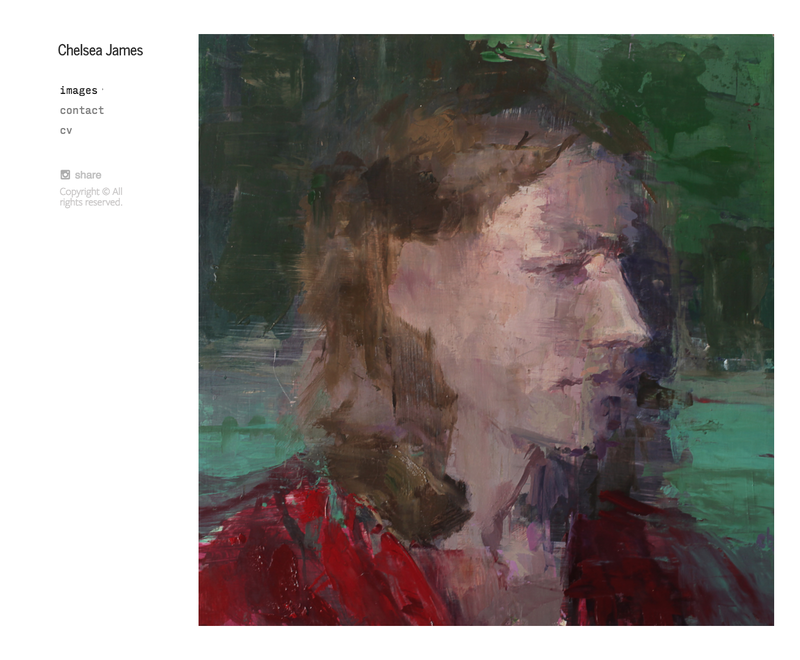 Ms. James continues: I paint for me, for that feeling of challenge, resolve, and completion. Oil paint is very complex, I feel as though I am at the beginning of understanding the intricacies of the medium. The possibilities are endless and I find that exciting. Being an artist enriches the way I see the world. When I paint something simple, I find that it’s infinitely complex. For example, when I am painting the landscape, I find that I notice little details that normally I would overlook, maybe the subtle value shift of colors in the clouds, or the edges and textures of the earth. My senses become more acute. DT: Where do you get your inspiration? CJ: I derive my inspiration from so many different sources. Art, travel, the landscape, architecture, Museums, photography, are just a few. Last year, Adam, Lulu and I drove from Amsterdam to France. I took thousands of pictures of the lush diversified landscape. This inspired me to try and paint the way that I saw the landscape, the way it made me feel. There is something very calming, infinite and alive about the trees, wind, and the landscape in general. But, I tend to gather inspiration wherever I am, and for that reason, I try to keep my eyes open. DT: What is your process? CJ: I sometimes begin with a loose drawing, generalizing areas with patches of color. It’s very rough; the objects are abstracted into shapes, mainly focusing on compositional elements and color relations. I then create unintentional marks to deliberately make mistakes, so that I can react, creating history and resolution in the process. Mistakes can create beautiful moments that feel spontaneous, and free, rather than contrived. I try not to let my painting become precious. That is a dangerous thing, because then I am afraid to destroy it, to move forward. If the painting becomes dear, how can you progress without becoming tedious? It almost kills me sometimes, but when this happens, that is when I have to destroy it by making unintentional marks to free up the form. And then I go back to my painting and bring it back. CJ: I was devastated at the time, but now that I look back, I realize that was a valuable lesson for me. It taught me to let go and have the confidence to find the form again. And usually, it is better the second time around. DT: What draws you to your subject matter? CJ: My landscapes and interiors seem to contrast one another, which keeps me interested. The landscapes are comprised from drawings, pictures, studies and memories, while the interiors are mostly perceptual, with only a little memory. Rarely does a painting emerge quickly without the need to continually paint over it. It is not uncommon for me to be 80% completed with a painting and if it’s not working or I become bored, I either mess it up by throwing paint at it, or I completely paint over the surface and start over. Many of my finished works have at least a couple of paintings underneath. DT: What, if any compromises have you had to make? CJ: It is a commitment, a time consuming investment, so you have to be very passionate. I have had to make many compromises with priorities, such as not getting a ski pass, or not going to that dinner party. I was working towards a show at Dolby Chadwick when I was pregnant and after the baby came. I had to make some very difficult compromises, like hiring help, and sleeping less. DT: Who is your creative sounding board when you are stuck or in a loathing stage of a piece? CJ: My husband. He is my most consistent and honest critique. When I feel stumped, or discouraged, he is the one that helps me believe in myself and he is not afraid to tell me the truth. Even though he is not a painter, he is very artistic and knowledgeable about art, and most importantly, I value his opinion. DT: What is required of a Painter to float rather than sink in the industry? CJ: To work hard, don’t give up and to not listen to outside negative criticism.